Abstract: This research work is done for performance step-up of nuclear greater power by HVAC-3HVDC line when load disturbance occurs in power grid-1. Three types of tie lines, HVAC-3HVDC, HVAC-2HVDC and HVAC-1HVDC parallel tie lines are applied for performance step-up of 12-area two interconnected nuclear greater power grids. For synchronizing purpose of nuclear greater power grid, this research work proves that HVAC-3HVDC parallel tie line is better as compared to the HVAC-2HVDC and HVAC-1HVDC parallel tie line. This project work also proves the HVAC-2HVDC parallel tie line is better as compared to the HVAC-1HVDC parallel tie line. Quality of all three types of tie line is judged by the frequency deviation of 12-area two interconnected nuclear greater power grid when load disturbance occurs in power grid-1. The major advantage of this research work is the performance of nuclear greater power grid is stepped-up by HVAC-3HVDC line without any high-tech controller.Keywords: Nuclear greater power grid, HVAC-3HVDC parallel tie-line, HVAC-2HVDC parallel tie-line, HVAC-1HVDC parallel tie-line, HVAC (High Voltage Alternating Current), HVDC (High Voltage Direct Current), traditional integral controllerCite this ArticlePankaj Kumar Sahu. Performance Step-up of Nuclear Greater Power Grid by HVAC-3HVDC Line. Journal of Power Electronics & Power Systems. 2019; 9(1): 1–14p. Abstract: This paper discusses about the inverter which transfers power from DC source to AC load side. Inverters are usually used in motor drive, static var compensators, uninterruptible power supplies (ups), etc. Pulse Width Modulation (PWM) technique is used because the total harmonics distortion is low as compared with other techniques. The switching scheme of sinusoidal PWM permits control of the frequency and the magnitude of the output. This switching scheme gives output with harmonics in range of the switching frequency and higher range which can be easily removed by proper filter design. This paper suggests half-bridge and full-bridge SPWM inverter with unipolar and bipolar switching schemes which can minimize the total harmonics distortion and enhance the output voltage. Keywords: Sinusoidal Pulse Width Modulation (SPWM), unipolar, bipolar, Total Harmonics Distortion (THD), Pulse Width Modulation (PWM)Cite this ArticleJaydipsinh Zala, Manan Desai, Kishan Bhayani, et al. Sinusoidal Pulse Width Modulation Switching Technique based Single Phase Inverter. 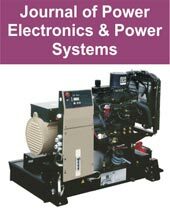 Journal of Power Electronics & Power Systems. 2019; 9(1): 1–7p. Abstract: The paper suggests a method for determining the frequency characteristics and transient response of capacitively graded high voltage bushings. It is based on an s-domain circuit model that describes the grading conducting foils and the insulating layers. In most cases, they are of different axial lengths. A system of simultaneous differential and algebraic equations is derived taking these differences into account. Its closed-form solution, subject to the boundary conditions, can be directly obtained in terms of parametric functions for the voltages and currents. They include both the location of the considered point and the Laplace operator s as independent variables. These expressions are used in order to identify the frequency dependence of the bushing’s input impedance as well as the types and frequencies of the different resonances. The expressions are numerically inverted into the time domain to get the voltage and current distributions. The technique is applied to different case studies demonstrating the effect of the wave shape of the source that initiates the transient and the termination of the central conductor. Keywords: Frequency characteristics, electromagnetic transient analysis, GIS (gas-insulated switchgear), capacitively graded bushings, VFTOs (very fast transient overvoltages), non-uniform lines, parametric functions, differential equations, numerical Laplace inversion, condition monitoring.Cite this ArticleSaied Mohamed M. A Contribution to the Frequency and Transient Analysis of High Voltage Bushings. Journal of Power Electronics & Power Systems. 2019; 9(1): 15–26p. Abstract: BLDC motors drives have gained importance due to power quality improvements and high efficiency. In low and medium power applications, it is mostly preferred. The speed control and power factor correction of the BLDC motor drive is achieved using a PFC converter. Here a bridgeless CSC converter is used. This configuration has numbers of advantages over other configurations of the converter. In this paper, position sensing is done based on the detection of zero crossing from the terminal voltages differences. The speed is controlled by varying the dc bus voltage of the inverter. It is a reduced sensor based technique. Arya TG, Manu Poulose. PFC-BL-CSC Converter Fed Sensorless BLDC Motor Drive. Journal of Power Electronics & Power Systems. 2019; 9(1): 27–33p. Abstract: This paper investigates the frequency characteristics and electromagnetic transients of a typical system composed of a high voltage bushing and a power transformer connected in cascade. Detailed distributed-parameter Laplace-domain models are adopted for the digital simulations. These parameters include, among others, the transformer winding’s series inductance, its capacitance to ground and the inter-turn capacitances. Moreover, the number, the geometrical data of the capacitively-graded bushing’s conducting foils and the dielectric insulating layers are also taken into account. The results of several case studies indicate that the consideration of the bushing’s parameters will impact the cascade’s frequency characteristics and its time response. On the other hand, the presence of the transformer winding and the treatment of its neutral point will affect the voltage and current spatial and temporal distributions within the bushing. Keywords: GIS, gas-insulated switchgear, capacitively graded bushings, parametric functions, differential equations, numerical Laplace inversion, transformers, bushing, equivalent circuit, electromagnetic transients, distributed parameters, frequency response, time response, resonanceCite this ArticleSaied Mohamed M. The Frequency and Transient Analyses of a High Voltage Bushing/Transformer Cascade. Journal of Power Electronics & Power Systems. 2019; 9(1): 42–53p.